The Knesset debate this week over Jewish prayer rights on the Temple Mount raised awareness of the current dismal reality, Deputy Minister Tzipi Hotovely (Likud) told Arutz Sheva. “It was an intense and important debate, due to the fact that it keeps bringing attention to the importance of visiting the Temple Mount,” she explained. The meeting focused on issues preventing Jewish access to the Temple Mount, which Jewish tradition teaches is the holiest place on earth. Jews are allowed to visit the holy site only during restricted hours, and are banned from praying there, ostensibly in order to avoid angering Muslim worshipers and sparking riots. The real reason lies elsewhere, Hotovely suggested. The Israeli left “is afraid of the religious symbol,” she said. “That’s the Left’s real fear. 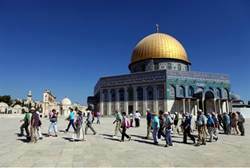 The Temple Mount is the place of the Holy Ark, and here you touch holiness itself,” she said. Hareidi Jewish leaders also oppose Jewish ascent to the Temple Mount, arguing that Jews should not enter the holy site without undergoing ritual purification procedures described in the Bible – which are currently not available. Hotovely rejected that argument. “It’s not a problem in halakhah (Jewish law), there are parts of the Temple Mount that it is fine to enter,” she said. Muslim boys play soccer on the holy Temple Mount (Flash 90). “It is an outrage that the Temple Mount is used as a soccer field, that must not continue,” she added, referring to Muslim youths’ soccer games outside the Al Aqsa Mosque on the mount. Hotovely called for change in Temple Mount procedures, “Currently, the entrance times are suited only for people who can give up a day of work. That is not reasonable or acceptable,” she declared. The Minister for Religious Affairs post is held by Naftali Bennett, head of the Jewish Home party, who also serves as Minister of Economy. Rabbi Eli Ben-Dahan (Jewish Home) serves as deputy minister. Hotovely called on Ben-Dahan to make equal time for Jewish prayers on the Temple Mount, as is done at the Tomb of the Patriarchs (Maarat Hamachpelah) in Hevron. Posted in Israel and tagged Islam, Israel, Jihad, Knesset, Liberalism, Muslims, Palestinians, Terrorism. Jews are not allowed to pray on the mount, but Muslims say Israeli is the apartheid state.